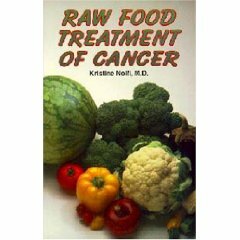 This book tells of the importance of raw vegetables in the diet of healing and general good health. Dr. Nolfi was a physician in Denmark for over 50 years. "Before I realized the actual importance of raw vegetable food, my attitude was exactly the same as that of other physicians—to treat the symptoms of the disease without thinking of preventing it. It ought to be the duty of the medical profession in future to find means of preventing to a much higher degree than now, instead of attempting to cure later on. That I, as a physician, went in for exclusively raw vegetable food is due to the fact that I became ill, even seriously ill, myself. I developed cancer of the breast. The disease had, of course, been preceded by wrong nourishment and wrong habits in the course of my twelve years of hospital training, when I suffered from sluggish digestion and catarrh of the stomach all the time, disorders which are still of quite common occurrence among hospital staff members. Since that time no change of the hospital diet has taken place in Denmark in this very important domain. On one occasion I was in a dying condition because of a bleeding gastric ulcer. This made me abandon meat and fish, and I became a vegetarian. Later, I took to eating a good deal of raw vegetable food. In this manner my digestion became regulated, and I felt better, though not completely well. In the winter of 1940 to 1941 I was exceptionally tired and dull, but I was unable to ascertain any specific disease. At that time I did not understand what was wrong with me, but in the course of the spring I discovered a small node in my right breast. Tired and dull as I was, I did not pay any attention to it until five weeks later. I discovered that the node was the size of a hen's egg. It had grown into the skin—a thing only cancer does. As a physician I had seen enough to be unwilling to submit to the treatment of cancer generally employed. I consulted my good friend, Dr. M. Hindhede, who dissuaded a trial microscopy. It would open up the bloodstreams and the cancer would spread; so I gave it up. And then I felt it as quite a natural thing that I would have to carry through a one hundred percent raw vegetable diet. I went in search of nature, lived for some time on a small island in the Kattegat, took sun baths from four to five hours daily, slept in a tent, bathed several times a day, and lived exclusively on a raw vegetable diet. Later I introduced this habit of life at the sanatorium "Humlegaarden." But I was still tired and continued to be so for the first two months, and during that period the node in the breast did not diminish; it remained unchanged. But then the improvement came. The node diminished, my strength returned, apparently I recovered, and felt better than I had for many years. When I had experienced good health in this manner for about a year, I tried by way of experiment (and urged to do so by Dr. Hindhede) to revert to a vegetarian diet supplemented by fifty percent of raw vegetable food. But it was no good. In three to four months I began to feel a stinging pain in the breast, in the sore-like tissue which the cancer had left where it had originally adhered to the skin. The pain increased much during the weeks that followed, and I realized that the cancer had begun to develop again. Once more I reverted to pure, raw food, which caused the pain to subside rapidly and the fatigue to become less pronounced. But, being a doctor, I realized that I would have to use the experience I had gained to help my sick fellow creatures."